The S&P500 slipped a negligible amount Tuesday in one of the lowest volume sessions of the year. To this point stocks are holding the recent breakout as they trade in a tight range between 2,155 and 2,170. Quite a reversal in fortune from the turmoil and uncertainty we faced earlier in the year. The biggest question on everyone’s mind is if these record highs are the real deal, or these are the last gasps before the crash. Last year many bull market skeptics claimed they would have a lot more confidence in this rally if we pulled back and refreshed. Many were quoting how many months it’s been since we had an X% pullback. Since then we’ve had two dramatic selloffs, the first occurring last fall and an even more dramatic one this winter. Now that we checked that box and reset the clock, have we won over the skeptics? No of course not. But now they have to be more creative when coming up with a reason to disbelieve this strength. For years I’ve been firmly in the secular bull camp. Over the last 100-years, “lost decades” have been followed by monstrous secular bull markets lasting a dozen or more years. That makes this seven-year old bull market relatively young in comparison. That said, secular bull markets contain brutal and terrifying selloffs. The infamous Monday in 1987 where stocks lost over 20% in one day was inside a phenomenally profitable, two-decade long bull market. This bull market will die like every one that has come before it, just don’t expect it to rollover any time soon. But that is the big picture and mostly applicable to long-term, buy and hold investors. Those of us with shorter timeframes can look at this 150-point rebound from the Brexit lows with a more cynical eye. Even in powerful up-trends, we experience the inevitable (and healthy) step-backs. Having moved as far as we have over the last few weeks, it is little surprise we ran out of buyers willing to chase prices higher. But even though we are struggling to find new buyers, stock owners are confidently hanging on for higher prices. Even without strong demand, prices are holding up well because so few owners are selling stocks. When supply is tight, it doesn’t take much demand to keep us levitating near record highs. At this point it seems many traders are watching 2,155 and 2,170 levels and waiting for prices to breach either of these benchmarks before making their next move. A wave of profit taking will hit us if we slip under 2,155 and jumping above 2,170 will trigger the next round of chasing. But since we remain in the low-volume summer months, we shouldn’t expect either of these moves to get too carried away. The breakout will likely stall near 2,200 while a dip would most likely bounce before testing 2,100 support. Even though we broke out to all-time highs, for short-term traders we are better off trading against these moves. That means buying weakness and selling strength. The sustainable buying won’t officially begin until big money managers return from their summer vacations this fall. 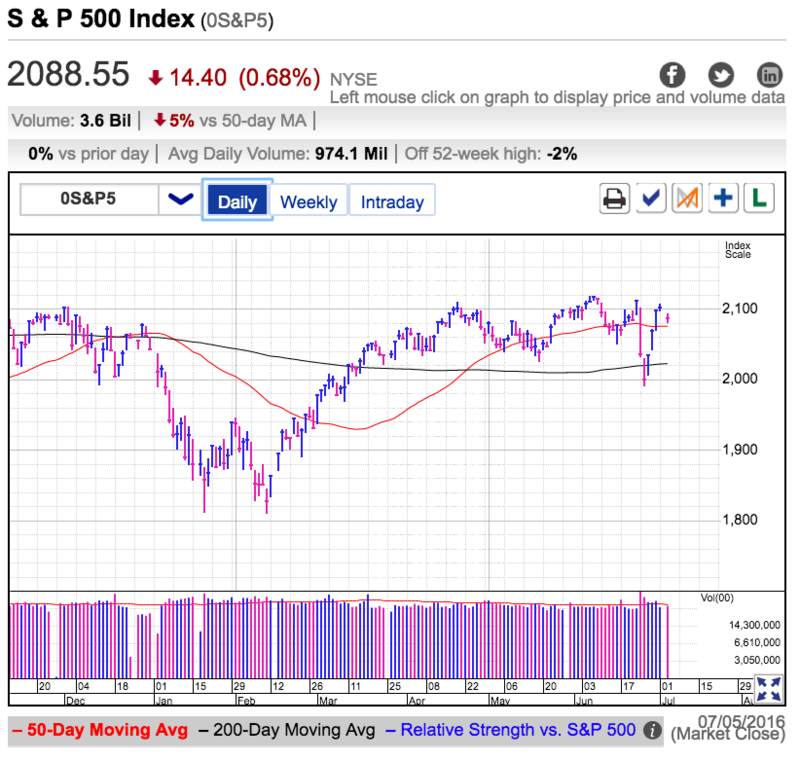 Tuesday the S&P500 stumbled modestly following last week’s shocking rebound that recovered nearly all of the Brexit losses. We lost 100-points in the two-days after the Brexit, but bounced back over the successive three-days as if nothing happened. That dramatic whipsaw leaves most traders confused and wondering what comes next. 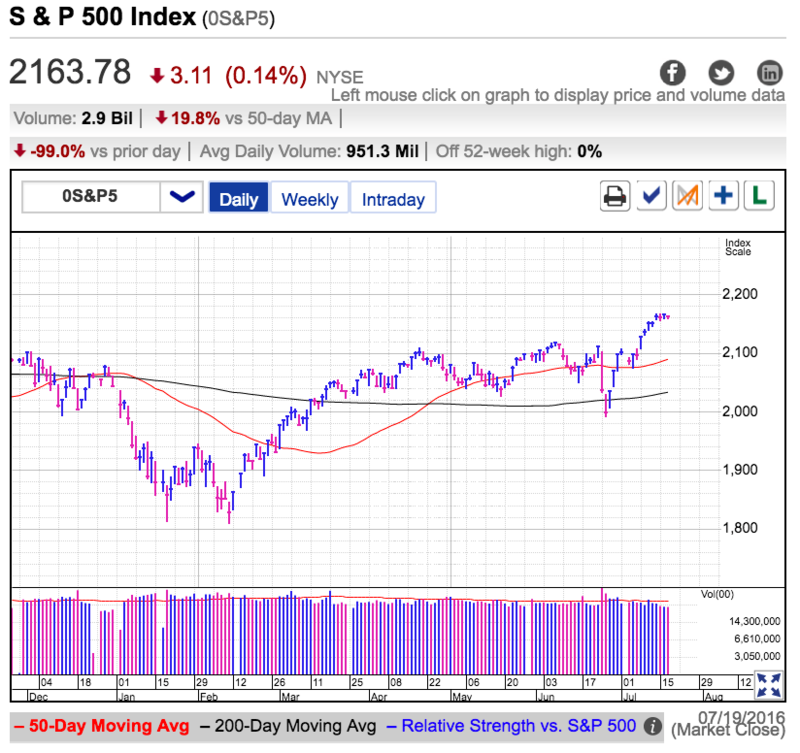 It is fairly obvious why the market sold off after the widely unexpected Brexit vote shocked the world, but even more unexpected was the powerful recovery that pushed us back near all-time highs. If the world is falling apart, shouldn’t the market be reeling? While that was the initial reaction, it didn’t take long for opportunistic traders to realize central banks would respond to this political calamity by pumping even more stimulus into the economy. Any talk of rate hikes was quickly replaced by reassurances of further easy money. It seems market thinks this medicine is more attractive than the Brexit is bad. But the above analysis assumes all of last week’s buying was thoughtful and rational. While it would reassuring to think that’s the case, the size and speed of the rebound reeks of emotional, reactive, and desperate buying. Anyone who sold or shorted the Brexit headlines quickly came to regret that decision and was forced to rush back into the market. Shorts were squeezed and the imminent close of the second quarter forced money managers to buy back their books ahead of their quarterly reporting. They certainly didn’t want to be the guy who had to explain to investors why they reactively sold at the exact wrong moment. Further proof of this quarter-end phenomena is the frenzied buying ended on the last day of the quarter and July’s prices have been floundering without fresh buyers. Given the way overnight futures are trading, it doesn’t look like things will get any better Wednesday. None of this should come as a surprise to experienced traders. One-hundred point moves over three-days are clearly not sustainable and bound to run out of steam at any second. Tuesday seemed to be that day for this rebound. Now that we stumbled back under the widely followed and psychologically critical 2,100 level, expect profit-taking and defensive selling to continue replacing last week’s reactive buying. I don’t foresee this turning into a big crash, just a bit of consolidation following last week’s dramatic swings. Two-steps forward, one-step back. Nothing unusual about that. “the time to buy the dip was earlier in the week, not now that we’ve raced 100-points in three-days. If anything, I’m more interested in shorting this strength because over the near-term, moves like these are not sustainable. Most of the short-squeezing and chasing has already happened. Any bear who had a reasonable stop-loss has been chased off by this relentless climb higher. And this afternoon we are running out of momentum as we struggle to find new buyers at the upper end of the Spring’s trading range. Looking forward to Wednesday and how to trade this, we tested and held 2,080 support and the 50dma Tuesday. Unfortunately these things are rarely one-day events and if overnight futures accurately predict tomorrow’s open, we will find ourselves slipping under this first line of technical defense. From there the next key level is 2,050 and expect at least temporary support. If we trade sideways in this area for a couple of days, that counts as our step-back and things start looking more optimistic. But if we cannot hold this level, expect another wave of defensive selling to swamp the market and the next stop is the 200dma near 2,025.